The Buckskin fishes well anywhere there are free-living caddis. The Buckskin is an “oldie but a goodie”. Ed Marsh, a veteran South Platte River angler and resident of Colorado Springs developed the Buckskin back in the early 1970’s. Once again—don’t let the simplicity of this pattern fool you! It fishes well anywhere there are free-living caddis. As an added bonus, it doubles as a midge larva in smaller sizes. One of our favorite droppers off a Buckskin is a Mercury Flashback Pheasant Tail. The Buckskin is an “oldie but a goodie”. 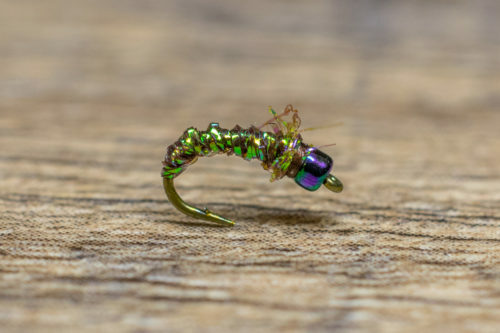 Ed Marsh, a veteran South Platte River angler and resident of Colorado Springs developed this caddis pattern back in the early 1970’s. Once again—don’t let the simplicity of this pattern fool you! It fishes well anywhere there are free-living caddis. As an added bonus, it doubles as a midge larva in smaller sizes. One of our favorite droppers off a Buckskin is a Mercury Flashback Pheasant Tail. 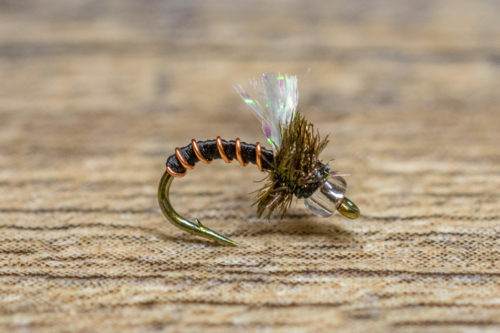 We recommend fishing a Buckskin as an attractor in a traditional nymphing rig, dredging it near bottom of the stream where you’ll find the largest concentrations of caddis larvae. It’s a good idea to concentrate your efforts on moderately paced riffles and runs as well as pocket water. It is especially productive between May and August when caddis larvae are routinely swept into the drift from higher flows. As and added bonus, a small Buckskin (size 20-22) is an excellent imitation for cream midge larva, which are effective year round. In off-colored water, it’s never a bad idea to use a bead head version to help it sink quickly and draw some attention to it. A Mercury Buckskin is a nice option during the post run off period, when the water is high, but clear.